« My Resignation From The Conservative Party. I think you grossly over rte the tax from this. Many will clearly be growing it and not declaring it. Then the huge cost of policing it all? 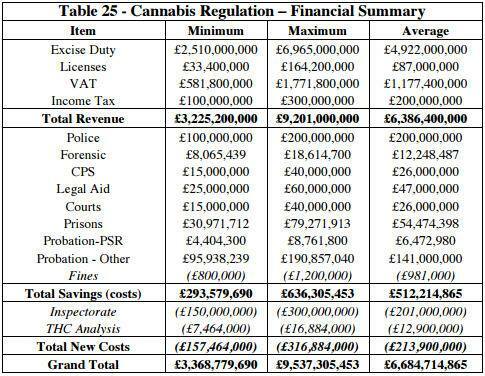 The table sets out a summary of the basis of the estimate. A full explanation is provided in the document linked to and this includes a figure of £300 million pa for policing the new system. The figure chosen is the average calculated, the upper figure is £9.6 billion or £185 million a week, so the claim is actually a conservative one based on the evidence. GYO produces income through licences (read the document) but of course there will be much more that continues to be produced outside the system. I think you probably underestimate the prevalence of cannabis consumption. Remember the estimate is based mainly on figures of usage from the British Crime Survey – which are almost certainly underestimates as people are reluctant to admit they are committing a ‘crime’.